ATTENTION CULT - it’s Friday, and we have a #GIVEAWAY for you. 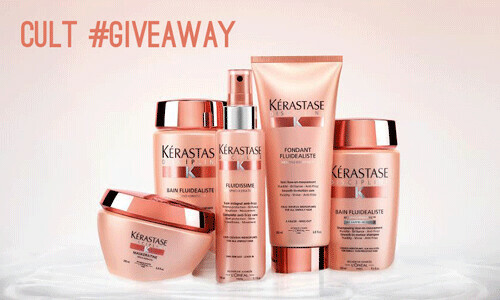 On that note I bring you, a #giveaway from Kerastase. Meet the Discipline Line. Loaded with products that will keep your beautiful locks free of frizz and put your blow drying woes at ease. (It’s Friday…feeling wordy). Discipline actually accelerates the time it takes to dry and make hair your behave. Hence, the name. 3 LUCKY WINNERS will receive: Kerastase Discipline Bain Fluidealiste($39), Bain Fluidealiste Sulfate-Free ($39), Fondant Fluidealiste ($42), Maskeratine ($62.50) and the star product Spray Fluidissime ($42), a lightweight serum that instantly eases blow-drying. This brings each giveaway to a total value of $224.50. Please follow the guidelines below to enter. Good luck! 1. Do ONE of the following — follow Cult of Pretty on Bloglovin’ OR follow Cult of Pretty from your Tumblr account OR subscribe via email. 2. Be social! Follow Kerastase on Facebook, Instagram, or Twitter to keep up to date with the latest greatest from the line. Bonus points for talking and tagging #KDISCIPLINE. 3. Leave a DISQUIS comment below [click through if you are reading this post in your Tumblr feed] and tell us how you tame your mane! De-tangler? Balms? Spray? NOTE: Please don’t comment in the ‘Ask Me Anything’ or ‘Fan Note’ area of Tumblr. If you do we will not see your comment and not be able to enter you into the contest! — Please everyone click through and leave a comment on Cult of Pretty itself. 4. You must be 18 or older to enter. If you happen to be under the legal age of 18 you can have someone else enter for you. Just remember that the product will be sent to their attention. 5. This giveaway is for US Residents only - unfortunately we are unable to ship outside of the USA. Contest ends Friday 10/10 at 12:00PM!